right out of the box." See the complete NewWoodWorker.com® review. Save $99 with the Cabinet Maker Undercutter Set! Make beautiful and strong rail and stile frame raised panel doors and drawers! Make authentic, classic rail and stile frame raised panel doors and drawers. This professional quality set contains six carbide tipped bits needed for cabinet making, raised panel doors, table tops and drawer assembly. These 1/2" shank bits are capable of creating fine furniture or custom cabinetry for a kitchen. Designed for up to 3/4" wood thickness. The Ogee Raised Panel with Undercutter (set #8389 ONLY) produces a flush or reduced upper panel profile, or adds a radius to the back of the panel. 3-1/8" large diameter. 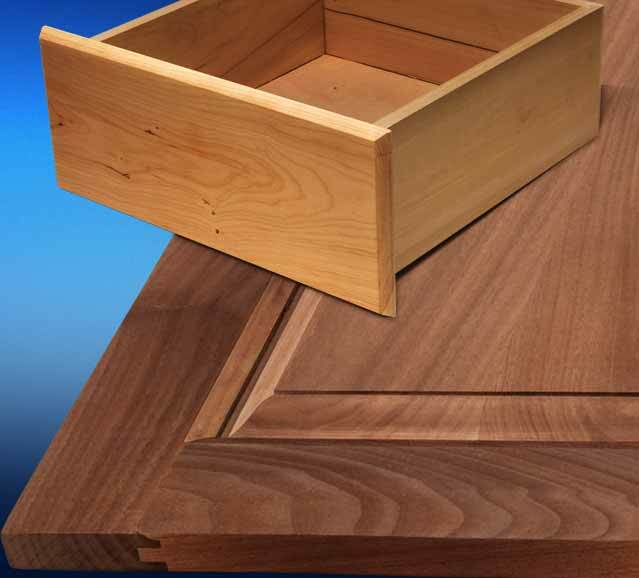 The Ogee Raised Panel router bit (in Standard Set #8387) puts a classic "ogee" edge on the floating panel in your door. 2‑3/4" large diameter. When the central panel needs to be wider than your stock, use the Glue Joint bit (with reverse cut edge joints) to mill two or more pieces of stock (1‑1/4" max.) to reach the required width. Glue it up, then raise the panel. 1-3/4" large diameter. The Drawer Lock bit creates a strong, long lasting joint that fits precisely because one bit makes the cut in the drawer front, and the side of the drawer, so both pieces fit perfectly. 1‑3/4" large diameter. The Round Over & Ogee Door Lip bit finishes your door edge professionally in one pass. 1‑1/4" large diameter. 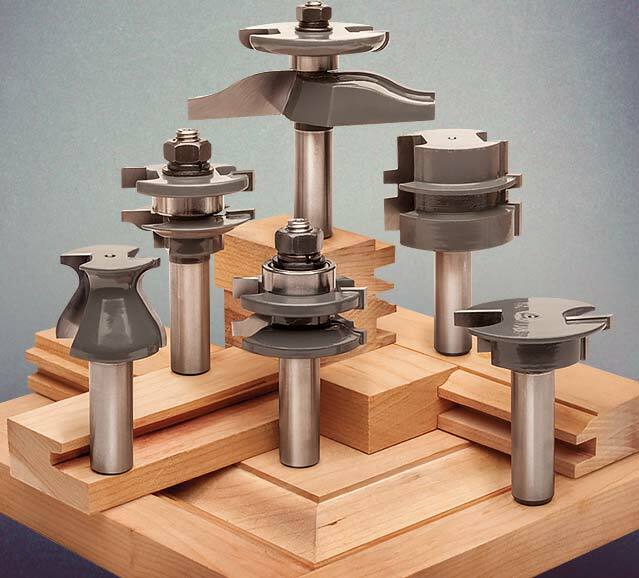 All Cabinetmaking router bits are intended for router table use only. 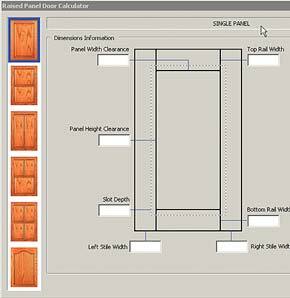 See Raised Panel Project Calculator to produce a precise cut list. SAVE $99! Includes Raised Panel with Undercutter, Matched Rail and Stile Set, Glue Joint, Drawer Lock, and Door Lip router bits. List $218.80. SAVE $105! Includes Raised Panel standard bit, Matched Rail and Stile, Glue Joint, Drawer Lock and Door Lip router bits. List $204.90. I seldom go to the trouble of making comments, but I just finished using this set of bits for the first time and absolutely loved them. This was the first time I had made raised panel doors via a router so I was apprehensive. It was so easy, I'm kicking myself for not trying it earlier. The only criticism that I have is that the FREE video I didn't order (it was nice for MLCS to include it) didn't exactly match the bit set. It showed how to switch the direction of the cutters depending on if you are making the rail or the style. I didn't have to take that step because this set includes both bits so you don't have to switch them out. Also, the calculator they included FREE (again I didn't know they were going to give it to me because I didn't order it) is PC only, no Macs. Not a big deal. I stuck the CD in my wife's computer instead and easily calculated all the sizes of the styles, rails, and panels I needed to cut. It saved a lot of time for me to do the math on my own. BTW: The set up block was also included free of charge. It was quite handy as well. Anyway, I love the bits. They were easy to set up and make really smooth cuts. I recently used these bit set for the first time on a wall-mounted fly tying cabinet. I was surprised how fast and clean the cuts are, and they match perfectly. Hope to get other bits along the time. Very recommendable product! I only got the bits two days ago and up to now I've only used the rail and style bits but I can tell you already these are wonderful. These are a replacement for a combination bit where you have to swap around the cutter pieces to make the different cuts. I will never do that again, too much set up and trial cuts. These bits were slick to set up with the optional profile guide and they fit together so nice. There is nothing else out there of this quality for this price. They are a bargain. I've had this set for 2 years completed about a dozen doors on different projects using MDF, Oak, Pine and Maple. The only only change I would make would be to included the panel bit with the larger Diameter as they have in the set with the undercutter. However this has to do with what I'd like to see rather then quality so still 5 stars. Suggestions: use a zero clearance infeed fence to help get a smooth cut with minimal tear out. Additionally purchase or make a sled to cut the ends of the styles my first attempt without a sled proved dangerous and looked bad. The Calculator download is $4 off! Quickly and easily produce more precise detailed cut lists, without costly math errors. Create doors (with up to four panels) or wainscoting panels. Get dimensions for a single door/wall or every door/wall on your project. 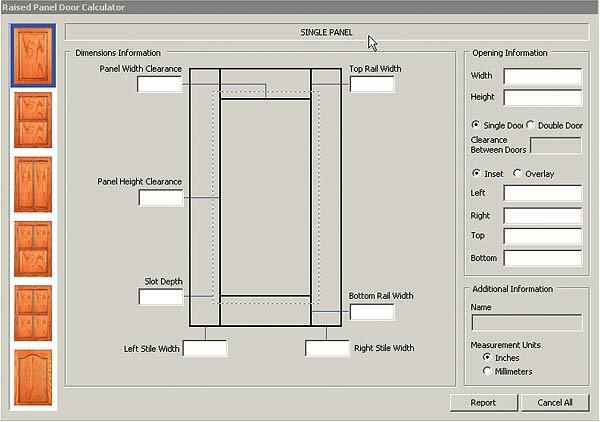 First enter stile and rail widths, opening size and door overhang, then the program quickly provides a fractional (inch) or decimal (mm) based cut list for your rails, stiles and panels. Program also includes a handy board foot calculator. Available as a download from our website or on CD (for Windows 98/ME/XP/NT/2000/VISTA/7/10). Not currently compatible with Mac OS. Easy to use, accurate, nice print-outs that give you all the necessary information. Would have received 5 stars if: 1> there was a way to add additional cabinets of the same size. As it stands now every single cabinet has to be entered even if they are the same size. 2> If there was a cumulative cut sheet for the entire project. It would make larger jobs easier to sort and cut. 3> You could add cabinet information for the single door portion of the program. I couldn't build raise panels door without the calculator. Have completed three that look really good but none of them are prefect, yet. It is not the calculator fault, just learning how to do six different things at the same time is difficult as well as having to have everything you need at your finger tips. All the training aids from MLCS are very much appreciated and very helpful. I also like the raised panel door bits I got from MLCS. I like to use 3/4" tenons, and 3/8" panel inserts. With this program they have to be the same. If you have to manipulate your dimensions after the program calculates sizes, might as will lay it out by hand to begin with. This little program is very handy. The instructions are a little lame but over all it was very helpful making my kitchen cabinets. Once I figured out the slot size including the space balls, creating the correct size door was a snap. In fact I have done over a hundred doors now and all were very accurate. I even made a raised panel filler panel with the MLCS Raised Panel Project Calculator that went across from one cabinet to the other with a valance below it.